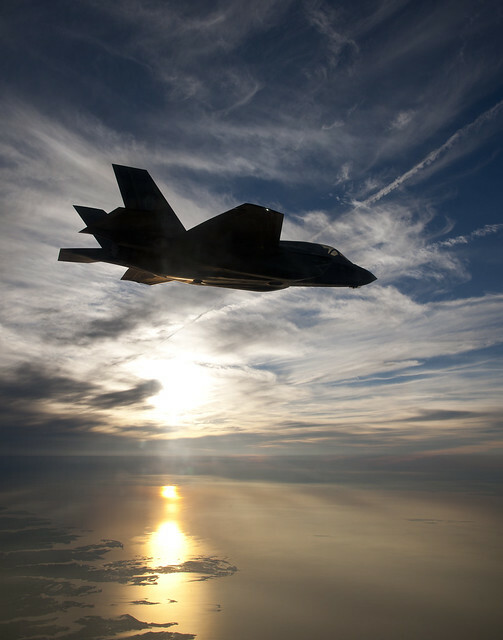 This beautiful shot shows a Lockheed Martin F-35B (BF-4) returning to Naval Air Station Patuxent River, Md., at sunset after completing a test flight. The F-35B is the short takeoff and vertical landing (STOVL) variant of the aircraft. Similar in size to the A variant, the B sacrifices about a third of the other version’s fuel volume to make room for the vertical flight system. Takeoffs and landing with vertical flight systems are by far the riskiest, and in the end, a decisive factor in design. Like the AV-8B Harrier II, the B’s guns will be carried in a ventral pod. Whereas the F-35A is stressed to 9 g, the F-35B is stressed to 7 g.
Unlike the other variants, because it can land vertically the F-35B has no landing hook. The “STOVL/HOOK” button in the cockpit initiates conversion instead of dropping the hook. The F-35B sends jet thrust directly downwards during vertical takeoffs and landing and the nozzle is being redesigned to spread the output out in an oval rather than a small circle so as to limit damage to asphalt and ship decks. The variant’s three-bearing swivel nozzle that directs the full thrust of the afterburning jet engine is moved by a “fueldraulic” actuator, using pressurized jet fuel. The United States Marine Corps plans to purchase 340 F-35Bs, to replace all current inventories of the F/A-18 Hornet (A, B, C and D-models), and AV-8B Harrier II in the fighter, and attack roles. The Marines are planning to use the F-35B from “unimproved surfaces at austere bases” and are preparing landing spots with “special, high-temperature concrete designed to handle the heat from the JSF”. The Royal Air Force and Royal Navy plans to use the F-35B to replace their Harrier GR9s, which were retired in 2010. One of the Royal Navy requirements for the F-35B design was a Shipborne Rolling and Vertical Landing (SRVL) mode to increase the maximum landing weights for carried weapons via wing lift.